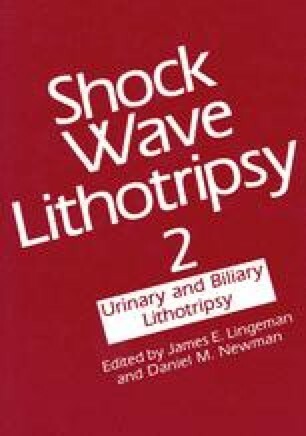 Two hundred forty-four consecutive patients who had been treated with extracorporeal shock wave lithotripsy (ESWL*) using an unmodified Dornier HM3 and who had no signs of hypertension prior to stone treatment were examined. These patients underwent a standardized blood pressure examination prior to stone treatment and at least four months after the last lithotripsy treatment. Of 204 cases evaluated, 12 patients had hypertensive blood pressure according to World Health Organization (WHO) criteria. Similarly 128 patients were examined after extracorporeal piezoelectric lithotripsy (PEL) using the Wolf Piezolith 2300. Of those, 119 cases were evaluated. In five patients hypertension was found within four months of treatment. With ESWL 5.8% of patients were hypertensive after treatment; with PEL, 2.9% became hypertensive. The calculated incidence of expected hypertension in a group with an equal age distribution is 2.3% (compared to the ESWL-treated group and 1.8% (compared to the PEL-treated group).